1. LONG PRESS WITHIN A TEXT FIELD ARES. 2. SELECT "INPUT METHOD" AT THE BOTTOM OF THE LIST. 3. 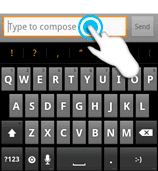 SELECT "SWYPE" AND YOU ARE READY TO GO. 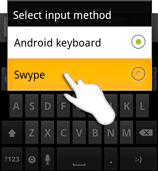 SO NOW SWYPE IS YOUR DEFAULT KEYBOARD. 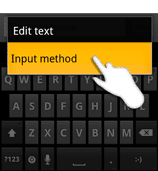 TO SWITCH BACK TO ORIGINAL KEYBOARD REPEAT THE SAME PROCESS AND SELECT "ANDROID KEYBOARD"